We all want straight teeth to help us achieve our perfect smile— this is why we seek out orthodontic treatment. But what sort of options are there? Dentists use many techniques, with traditional braces and Invisalign being two treatments of choice. Both approaches work to straighten teeth and place them in proper position, serving to improve patient smiles and function. Invisalign uses clear plastic trays for teeth positioning. This method for straightening is used with non-complicated cases. The trays are worn 24/7 and changed out every two weeks. Of course, the most appealing feature of this method is the trays are relatively invisible. Invisalign does not affect speech and allows for social comfort. 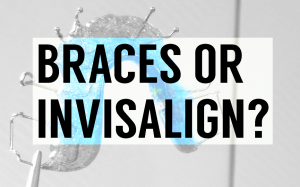 As the name suggests, Invisalign trays are not readily noticeable. Invisalign works well for esthetic and simple dental alignment issues. Traditional dental braces, on the other hand, are composed of metal brackets that run along a wire attached to the teeth. Braces work well with people who require functional improvement of teeth position, including alignment and straightening. They are also used for occlusal issues and poor bites. Dental braces are not removable like Invisalign trays, but they are the treatment of choice in more complicated cases. There are advantages and disadvantages in each method of treatment. The final decision should be based on the unique dental needs of the patient and which technique addresses the individual patient’s needs in the most efficient and effective manner.